–Your new life together has just begun! 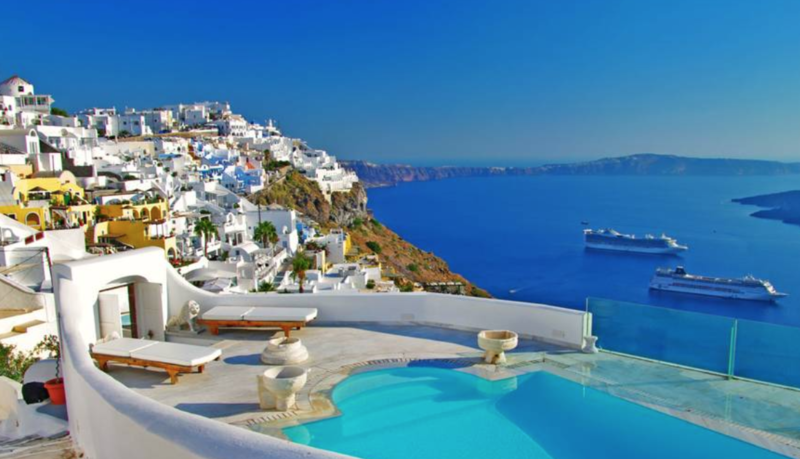 So why not escape to a dream honeymoon in Greece? With thanks to Grecotel, we have managed to hand-pick four of the most romantic destinations to make your honeymoon the once – in – a-lifetime trip that it should be. The perfect place to let romance blossom in paradise. From the moment you check in as a newly wedded couple, this exclusive resort promises five star service backed by the Cretan Riviera’s picture perfect surroundings. All suites, villas and rooms feature designer furniture and endless sea views. The resort also offers a full line up of entertainment for couples one speciality being an outdoor cinema, and Heraklion, one of the world’s most romantic cities, is just 20 km away. The Rose Garden Honeymoon Package includes a welcome drink and fresh fruit in your room. Find your bed adorned with a special decoration of sugared almonds and rose petals. Enjoy a romantic breakfast on the shaded veranda before you soak up the sun by your private pool. Then, celebrate with a candlelit dinner under a starry night’s sky. When you want as much luxury as possible, then this exclusive resort, set on a private peninsula, provides peace in an unspoilt location, though Corfu Town is only 12 km away. Regal villas feature interiors splashed in royal colours with hand painted murals. Each villa overlooks the sea, whilst shaded verandas lead you straight onto the beach.To top things off, you can enjoy live entertainment, Michelin starred cuisine and an option to sail away on the Ionian Sea. Pick from a sunset cruise or an on board dining experience. You can even charter a private yacht during your stay. Focused on romance, the Pearl Perfection Honeymoon Package includes a beverage on arrival, bed decoration, a candlelit dinner and Melokarido a Greek tradition of honey and walnuts symbolising the sweetness of life. There will also be a romantic breakfast served in your room the next morning. With top notch service and laid back energy, Mykonos Blu creates an intimate retreat in which to indulge.Tucked away on the famous Psarou Beach, the resort’s whitewashed décor complements dramatic views over the Cyclades. What’s more, a personal butler is at your service 24/7. For a once in a lifetime experience, spend your honeymoon in a divine villa with private pool and sparkling sea views. Relax with a massage, make the most of your private garden,or float in aromatherapy tub for two. Elixir Spa therapists can even arrange massages and beauty treatments in the privacy of your villa ,or outdoors by your pool.Complete your stay with the Orchid Symphony Honeymoon Package,which adds a 60 minute relaxing massage for two in the Elixir Alchemy Spa with an outdoor fireplace and a private garden. Overlooking the mythical Temple of Poseidon: this venue is dedicated to making your honeymoon truly unforgettable. Bask in a bath filled with scented water, flower petals, bubbles or aromatherapy oils, whilst the mood is set with candles, music and lighting. Nourish your body and soul with an Ayurveda treatment while you admire landscaped gardens and a sea view forest. With every detail of your honeymoon arranged, your hardest decision will be whether to relax together by the sea, enjoy an in villa massage, make the most of your gorgeous private garden or float away in a Jacuzzi tub at the spa.